Habitat & ecology: Haemanthus albiflos occurs in shady habitat in forest and bushveld vegetation mainly near the costs and often on the coastal sand dunes or on rocky sea shores exposed to salt spray but also on cliff faces in river valleys where it clings in large clumps, and in shady places on high altitude inland mountain ranges. 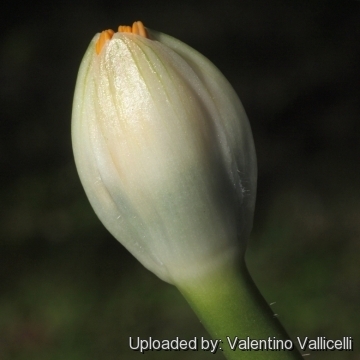 It is the only Haemanthus species found in both winter and summer rainfall regions. Bees and butterflies visit the flowers and are probably the pollinators. Haemanthus virescens var. albiflos (Jacq.) Herb. Haemanthus pubescens (Herb.) Ker Gawl. 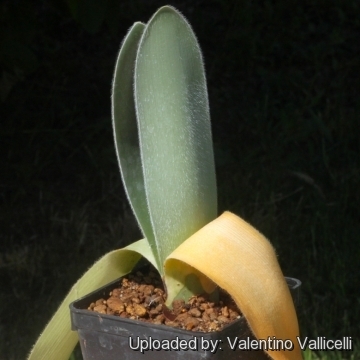 Haemanthus virescens var. pubescens Herb. Haemanthus virescens var. intermedius Herb. 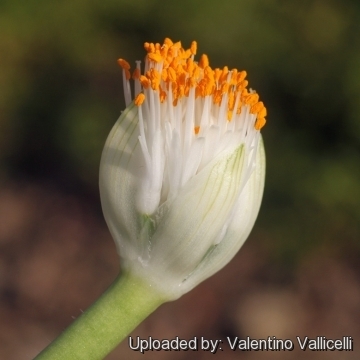 Description: Haemanthus albiflos is an evergreen bulbous perennial geophyte with small white flowers in dense umbels. 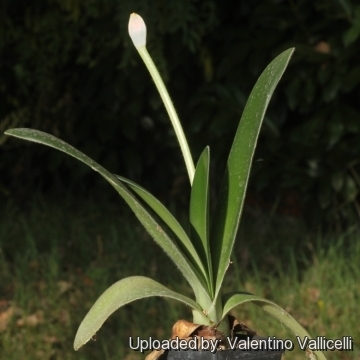 The whole plant grows to 20–30 cm tall when in flower by 15 cm wide. It is the best known of the three evergreen species of Haemanthus (the other are Haemanthus deformis and Haemanthus pauculifolius). It is however a very variable plant. The hairy-leaved forms known as var. pubescens are no longer considered distinct. Bulb: Ovoid, sometime flatted, up to 8 cm broad. Scales more or less equal, horizontally truncate. 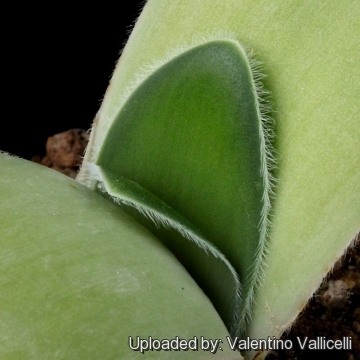 The upper half of the bulb is usually exposed (semi-hypogeous) and bright green. In time it slowly forms domed clumps of up to about 10 (or more) mature bulbs sitting on top of the compost.. Roots: Perennial, thick and fleshy spreading out horizontally over the medium. Leaves: 9-40 cm long and about 3-11 cm wide, distichous, strap-shaped or broadly elliptic, inclining to prostrate, pale to dark green or greyish-green, usually smooth and sometimes shiny but may have a covering of short, soft hairs, and occasionally yellow spots on the upper surface. 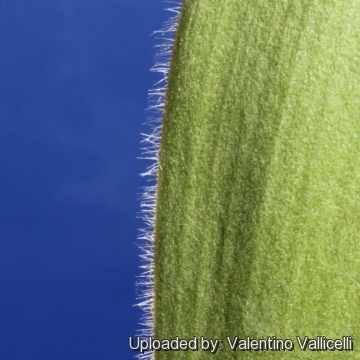 Margins more or less ciliated. Since it produces a pair of leaves once a year and is evergreen, the plant may have one to three pairs of leaves. Inflorescence: It produces a 30-80 mm wide ovoid or inversely conical umbel (brush-like head). 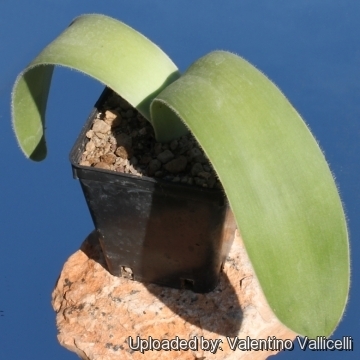 Scape 5-35 cm tall, stout, compressed and more or less furred. Each umbel consists of as many as fifty densely packed, erect, narrow, white florets, held within broad green-veined white bracts. Pedicel very short, upright. Perianth tube 4-7 mm long. Corolla funnelform, narrow. Segments of the limb upright, linear, three times long the tube, slightly separated. 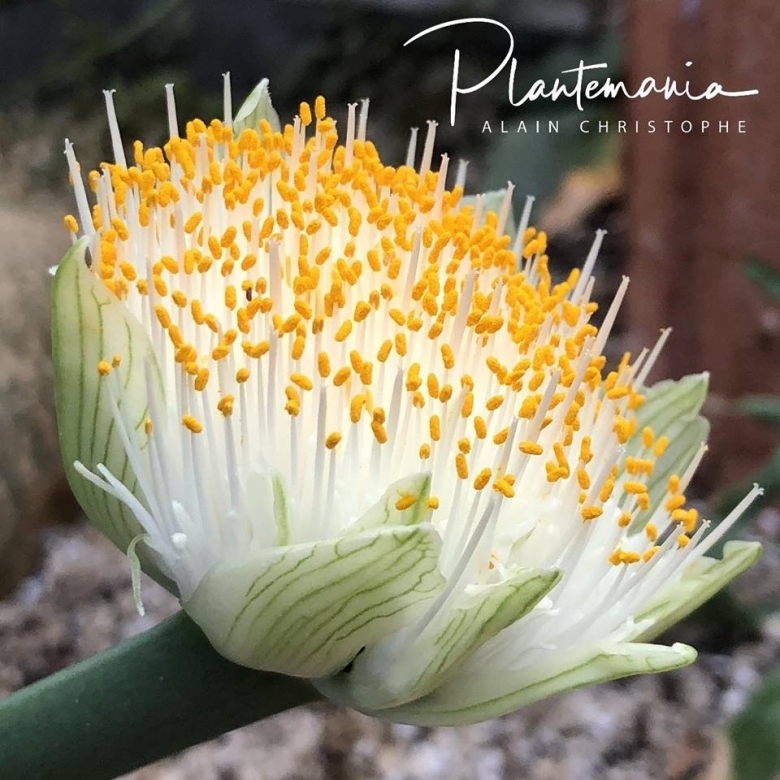 The erect stamens protrude conspicuously beyond the tips of the flowers and their anthers are ovate-rounded and turn bright yellow or orange when ripe. Style rather thicker and taller than the stamens, upright. Stigma slightly trifid, spreading. Fruits: If pollinated, it produces clusters of most attractive berry which take a bright orange or vermilion colour (occasionally white) when ripe. The berry are about the size of a pea, oval, fleshy, three-celled, with one-seeded cells and have a distinctive musty odour. Blooming season: It has a long flowering period extending from late autumn to winter, but sporadic blooms may also appear at any time of the year under cultivation. Cultivation and Propagation: It presents no great difficulty in cultivation and tolerate extreme neglect. The ease of culture, the handsome leaves, the long flowering season and the showy red berries make it an invaluable subject for for shady spots in the garden. Soil: It needs a slightly acid medium comprising equal parts of well rotted compost, coarse river sand (or pumice) and loam. 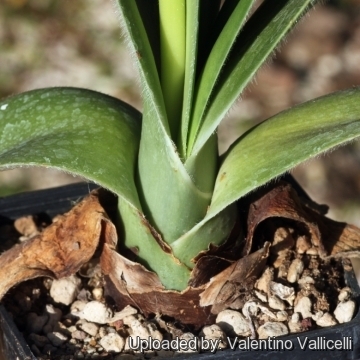 Plant the bulbs with the with the upper half exposed and can remain in the same position for many years. Plants flowers better if restricted in a small pot and like to become pot bound and mature bulbs flower reliably every year, and only need to be divided every seven or eight years when flowering performance starts to diminish. Give it excellent drainage. Exposure: It prefers not to be in full sun, and will even grow and bloom in heavy shade in a position similar to that preferred by clivias, and likes to remain undisturbed for many years once established. If the plants get too much sun, they will look chlorotic, although still bloom very nicely. Watering: As it is an evergreen plant, it likes moisture throughout the year. Water the plants heavily once per week during the summer growing period, but reduce watering in winter to once every two weeks, although they do survive heavy winter rainfall in mild parts of the Western Cape. It is however very tolerant of under-watering. Hardiness: They are sensitive to heavy frost, but can tolerate sporadic light frost. Salt spray tolerance: It is very tolerant and can be grown on sea shores exposed to salt spray. Garden uses: In warm and temperate climates grow it in shady courtyard gardens, in raised beds or shaded rockeries. In countries with cold winter climates, this is a very successful indoor plant and thrives on "healthy neglect". It also makes an excellent subject for plastic or terracotta containers and these need not be deep as the roots naturally spread out horizontally. When grown in the garden, Haemanthus albiflos makes an excellent companion subject to other shade-loving plants. Traditional uses: This plant is reported to be used in traditional medicine to treat chronic coughs and as a charm to ward off lightning. Pest and diseases: The bulbs of Haemanthus albiflos is not often subject to attack by pests or diseases but the leaves are sometimes invaded by the dreaded lily borer, also known as amaryllis caterpillar. The plant may also be susceptible to attack by mealy bugs, and the leaf margins are chewed by snout beetles and slugs at night. Propagation: By offsets or from seed. It reproduces readily by adventitious buds or offsets, which may be removed when the flowering period is over. Offset bulbs are best separated from thick clumps in early spring, as temperatures begin to rise, ensuring that each offset has a good supply of roots. They should be replanted as soon as possible and kept well shaded until the bulbs have established themselves and formed additional roots. Seeds form readily and should be harvested and sown as soon as they can be easily removed from the bright orange, fleshy berries. Seeds may take several months before the first leaf appears above ground, so be patient, seedlings should be allowed to remain in the trays for two years, and can be planted out into the garden or into permanent pots in spring at the beginning of their third season and a further years is needed to flower for the first time, under ideal conditions.